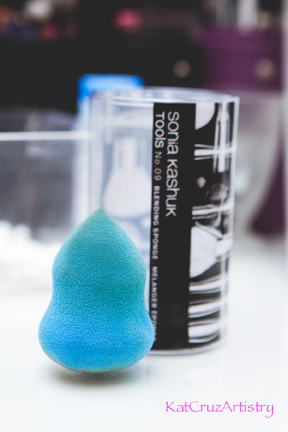 Blending Sponges are a soft sponge that is designed or shaped for a controlled and flawless finish application. Primarily, this is used for liquid and cream makeup products. To use this, you are suppose to wet the sponge first with warm water and squeeze the excess water. For application, dot the foundation onto the skin and dab or pat the sponge onto the skin in circular motion. 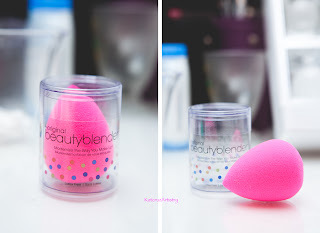 I owned 3 blending sponges, all from different brands which are Sonia Kashuk, Joe Fresh and the Beauty Blender. Since I have a few of them, I can easily compare the products and help you purchase something worth your money. Above is the Sonia Kashuk blending sponge, this was the first sponge that I have purchased, this is under $11. 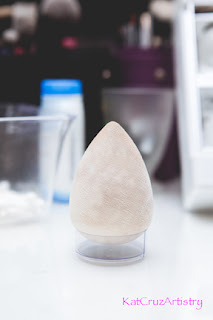 Since I didn't have any other sponges to compare it to, I think this was an okay product, the pointy tip, is good for blending around the crevices around the eyes and nose. The downside to it, because of its shape, it's quite difficult to roll the product onto the skin. The texture is dense and stiff, even after wetting the sponge, the shape remains the same and it does not blend well. Above is the Joe Fresh blending sponge, this has an egg-shape which rolls onto the skin well but the texture of it is pretty much the same as the Sonia Kashuk which is a bit dense but not as stiff as the Sonia Kashuk. The shape of it doubles the volume after wetting it but it does not get any softer. I must say it does distributes the product evenly. This cost about $10. Between the two, I do prefer the Joe Fresh blending sponge. Lastly, is the Beauty Blender, this is what mostly makeup artists carries in their kit. The price is in the high end for a sponge, $26 cdn. but it's worth buying it. This was given to me by a friend who's been recommending this product to me for the longest time but I kept on holding off because of the price and I didn't really see the purpose of buying another one if they all feel and work the same. However, after using it, now I completely understand why this is such a popular product. This is not just an ordinary sponge. This also has an egg-shape and it expands after damping it with water but the texture gets softer as you use it. It's gentle on the skin which makes a flawless finish. Because of the shape, it allows you to roll the foundation onto the skin preventing any streaks. This is also great for toning down blushes, bronzers when applied too much. Honestly, this is what I've been reaching for lately putting my other foundation brushes onto shame. This is a multi-task sponge, I use this for foundation, concealer and cream blush. I recommend this blending sponge to anyone.